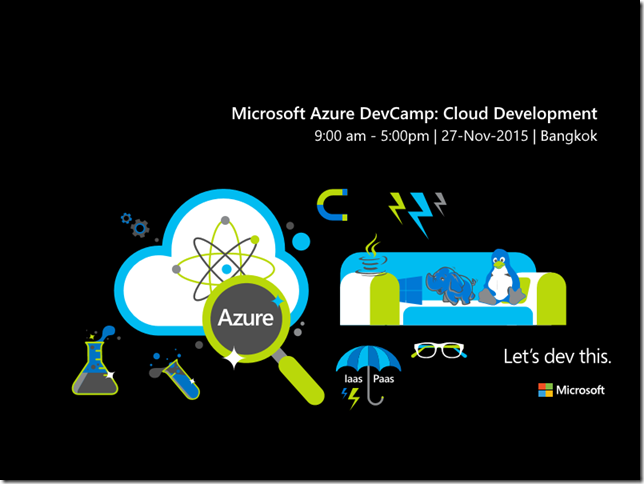 Microsoft Azure Dev Camps or Azure Cloud Developer Essential Camps are free & fun events for developers, by developers. You do not want to miss this unique event. Fees : This event is brought to you by your local Microsoft office and is free of charge. However, delegates are responsible for booking and paying for their own travel and accommodation. At this Microsoft Azure DevCamp you will learn how to use the new Microsoft Azure features and services including App Service, and Visual Studio 2015 to build and move a variety of apps to the cloud. You will see how to build websites, mobile applications, and enterprise-class applications. The Microsoft Azure DevCamp is a great place to get started with Microsoft Azure development or to learn what’s new with the latest Microsoft Azure features. You are required to BRING YOUR LAPTOP to do hands On Labs (HOL). You will do HOL at your pace with help from instructors when you need it. Along with your laptop computer, we ask that you activate your free 30-day trial Microsoft Azure subscription prior to your arrival. Intro to Azure Hello Azure! In this talk you’ll learn about the broad service offerings of Microsoft Azure. All the pieces, Compute, Data, App and Network Services; combine to provide one powerful enterprise-grade cloud platform you can trust. App Service Microsoft Azure App Service is the fastest way to build for the cloud, providing a highly scalable enterprise-ready environment. In this talk learn how Azure App Service enables you to build applications with your language/framework of choice and deploy with ease. Identity & Access Management Learn about ADAL Library, O365 Library, OData Services. HOL – Deploy a SPA with AD to Azure Build a Single Page Application (SPA) with ASP.NET Web API and Angular.js using Azure Active Directory to log in users. Data It is rare to see a modern application which doesn’t require the storage of data. Microsoft Azure has many ways to fulfill your storage needs be it Relational, Non-Relational or needed far and wide we’ve got you covered. Needed that data crunched yesterday? No time to set up an environment? Microsoft Azure HD Insight has you covered for all your Big Data needs. Spin up a cluster in a matter of minutes, pull it down just as fast. HOL – Data Get your hands dirty using Microsoft’s highly scalable and available Database. Learn how to build web apps using DocumentDB. Here are summary of some personal items you will need to bring to the DevCamp.